It’s nearly mid-March. Do you know what that means? Magnolia season. Dogwood season. Bulb season. And the hyacinths are nearly here! 1. Don’t anyone write me an email declaring outrage over the lack of calla lilies on the list. Relax. This isn’t the Olympics. They can try out again before their peek has passed. 2. Yes, I am an eccentric, sequined cat lady and I can have Top Five Flowers list if I want to. You might have a list of Top Five Restaurants, or Top Five Friends, or Top Five Nights Involving Pantyhose, Grain Alcohol and a Muskrat. To each his own. No judgments. There are few things I love more in life than the smell of the first March hyacinth. The window for it’s arrival gets narrower every year, and when you find it, not only does it come accompanied by a beautiful flower, it comes heralding the best news you have heard in months: Spring is officially here. So, really, these aren’t so much hyacinths as they are big pink and purple turkey legs. 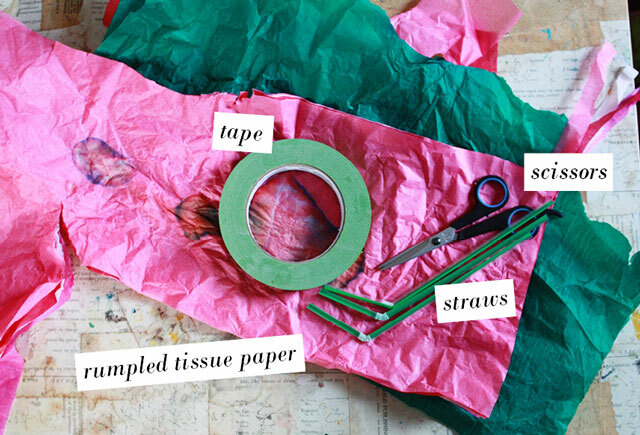 Note on tissue paper: Rumpled old tissue paper works best on this one. If you do not have any old stuff, wad it up for a day or two before you start –it will help the fibers to relax a little which will prevent them from tearing so easily. Also, as you may have noticed above, my tissue paper has a big stain on it –the result of a simple water spill (all the colors in the stack ran together)…it gives some of the flowers a two tone effect that I think is pretty neat. But you could skip that. Or just spill water on a stack of colors and get them to run on purpose for a mottled/watercolor effect. That might be cool, no? rectangles started as 3″x18″ but you could play with the proportions to get all sorts of cool results. I like to work in stacks of four, but you could do a lot more if you are the delicate and efficient type. I am the rhinoceros type, so I stick to no more than four. Snip the fringe (or fringesnip if you are sassy enough to pull off that kind of verb) on the folded edge. The narrower the better, just be sure to leave the outer half inch in tact. Adhere one end of the tissue fringe to the end of a straw and start rolling. Go around the top three, maybe four times then start spiraling downward. 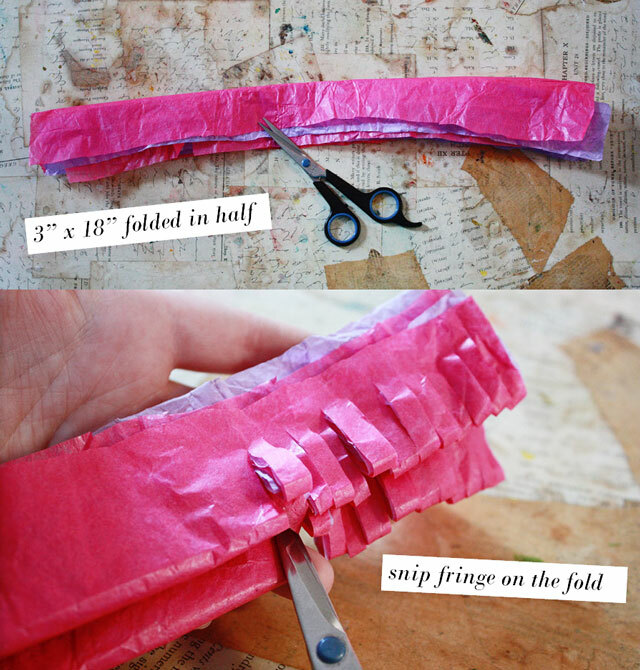 Use a piece of tape to adhere the end of the fringe. Add a leaf if you want. I think they are more authentic looking without the leaves, but a little green won’t hurt. What a lovely idea! Thanks for sharing, I am very impressed with this flower! SO cute and easy too! I see a mothers day gift for the kiddos to make! Beautiful! I love hyacinths! BTW, stargazer lilies are my favorite flower. They were the main flower in my wedding bouquet. i love these!!! love love them. 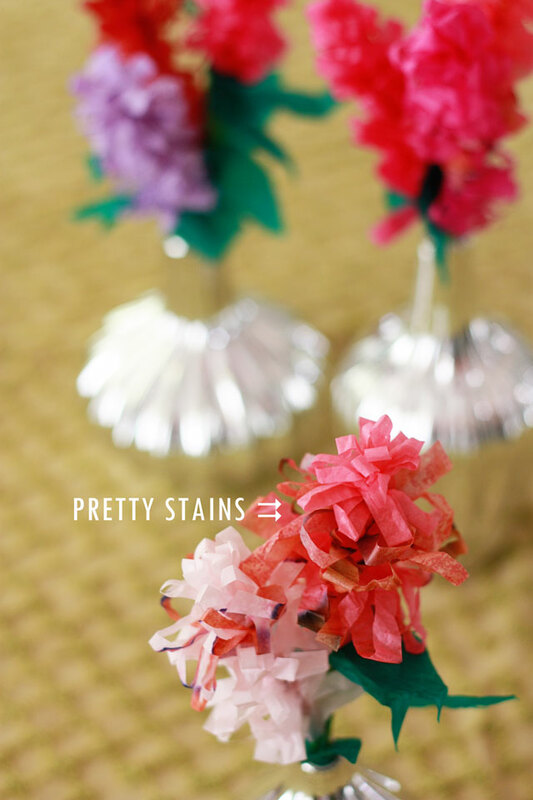 i just included your coffee filter papers in a paper flower round up. i should go back in time to add these in there as well. i can’t wait to try them…they kind of look like classier, gigantor versions of frilly toothpicks. with leaves. That is usually the feeling that I come away with when I visit your blog. Thanks for your help in making theae flowers. I love them and can,t wait to do it. LOVE! Must find a reason to make them…..
You are amazing!!! DO you know that? Simply amazing!! There is a special place in heaven waiting for you to come create new stars and moons and worlds to share with the rest of us! A whole new animal has been created! 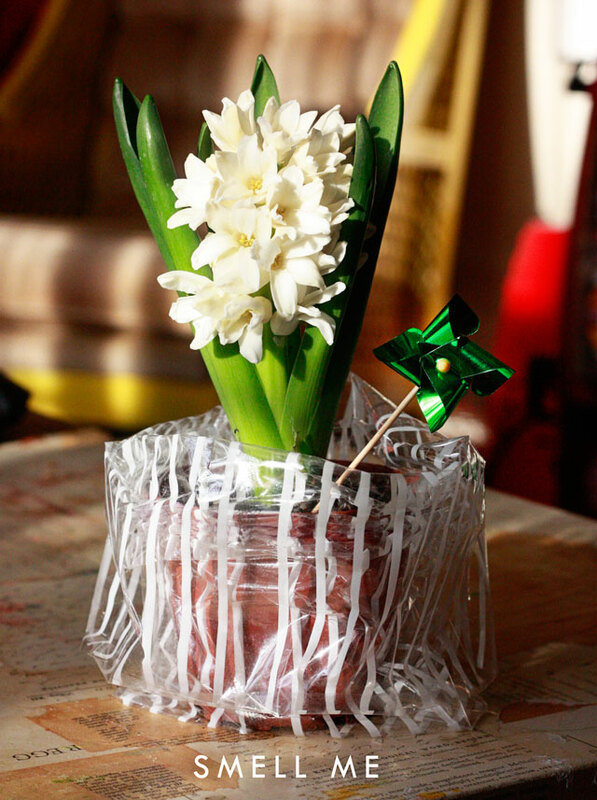 I have never seen a paper hyacinth (granted, I haven’t looked), and these are just stunning, adorable and cool! Genius to adapt the turkey leg frill!!! These could also pass for lilac if you stick them in an indoor plant (like those ficus things). Stargazer Lily is my #1 flower, as well! Brilliance. Pure brilliance. Your flowers are inspiring! Will be definitely making them this spring!! good idea! That ficus won’t see it comin! You know, I saw that in Pinterest –I wish she told us how she made them. 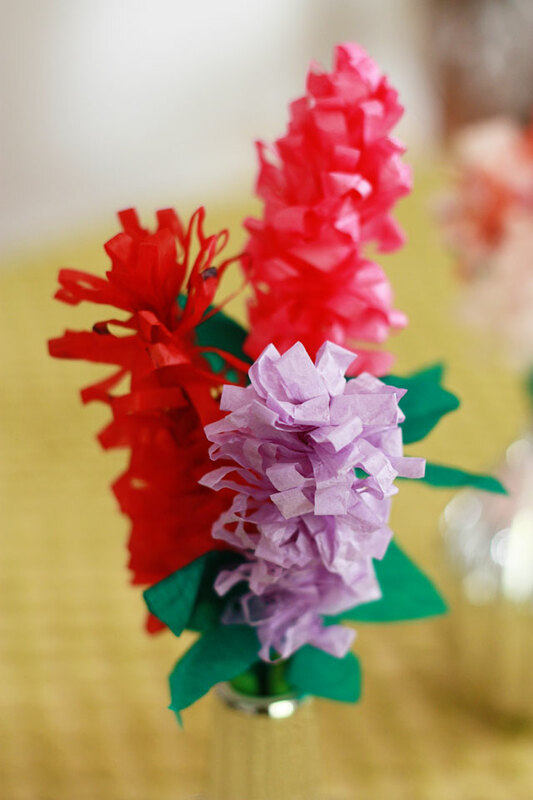 Do you think it’s just twisted up crepe paper streamers? I would love to do this but you need a giant room to pull off that sort of scale. Hmmm…. those are totally gorgeous! you never cease to amaze. i have to add two other favorite flowers to be considered: carnations and ranunculus. These are great! I wonder if they could be made with ribbon? Looking forward to more flowers every week! Love Spring bulbs, my son and I are forcing some gladiolas in the kitchen as an experiment right now! 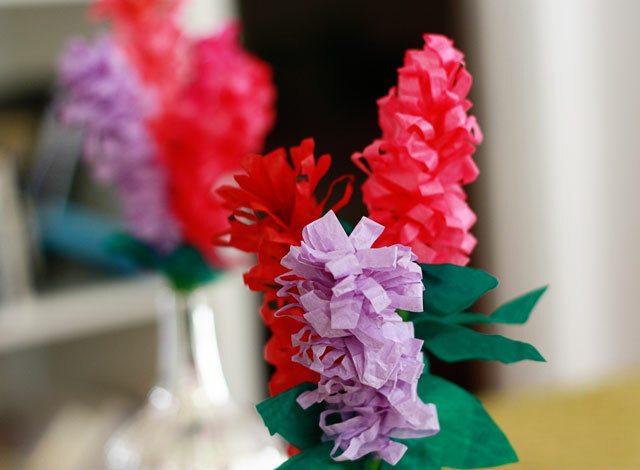 I love these paper flowers and the Adler-esque vahses are gorgeous too. You rocked these hyacinths! Love ’em. They have always been one of my favorites. In every house my parents have ever lived, my mother always has these pretty little “smell goods” popping up in early Spring. As an aside, my mother had a cousin named Hyacinth. I don’t think that has anything to do with why she has always planted them. I remember being a little girl, going to family reunions and wondering why every body called that lady Hyacinth. If I were in your place, my ego would be huge by knowing how awesome I am. 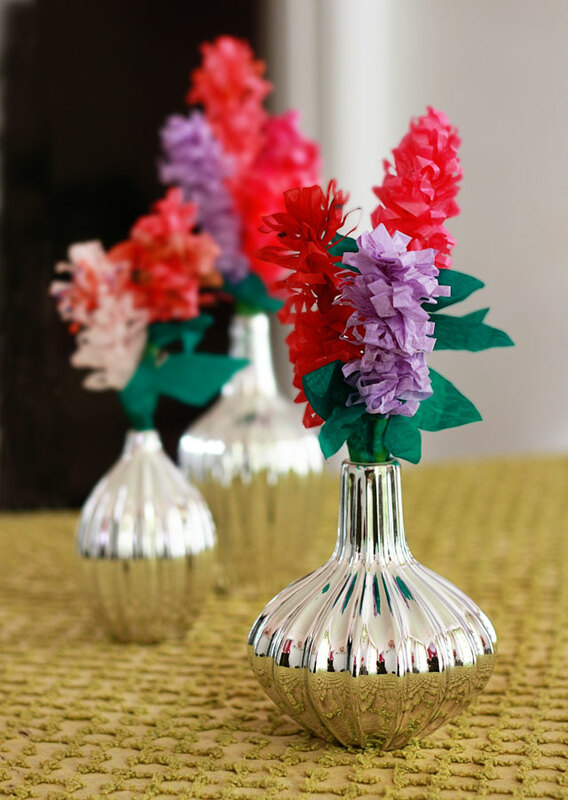 Aunt Peaches we love this tutorial because we love hyacinths and you make it easy to make them! I don’t want to be a complainer, but, I have clicked on the “Hostess” button a few times and I have yet to have any cupcakes come out of my computer. Do you think you can fix that? Thanks bunches! I had Zoom, and I noticed very little difference. My family, friends and Coworkers didn’t even notice. I also use crest white stripes. WHERE can you find green straws for the stems please? Thanks for the cool, creative, and beautiful idea! Ikea. Not sure they still carry them but I know Party City (probably most party stores) carry green straws. Bamboo skewers and green tissue paper or florist tape instead of straws? 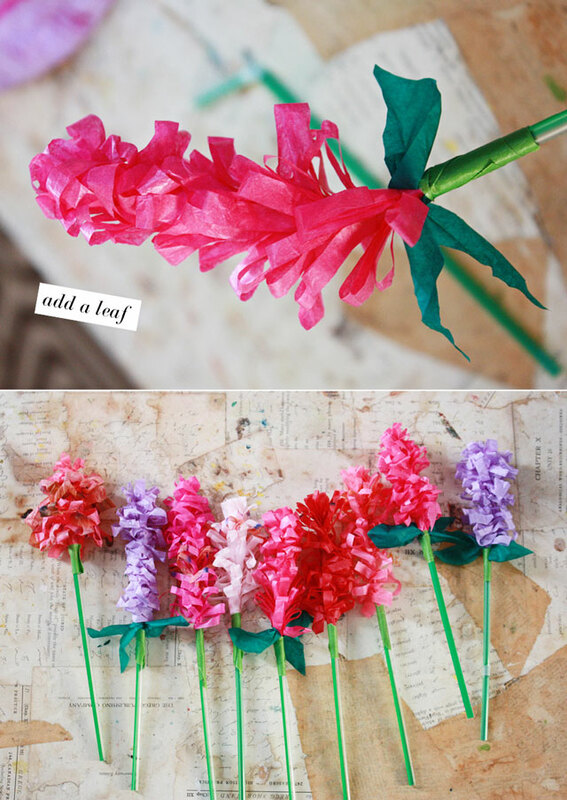 Very beautiful and very easy project to make! I got addicted to making flowers this last week, and I wanted a lil wisteria to go with my bouquet. I didn’t find convincing tutorials for smoothing smaller until I looked at your hyacinth and I got struck by DIY lightning. 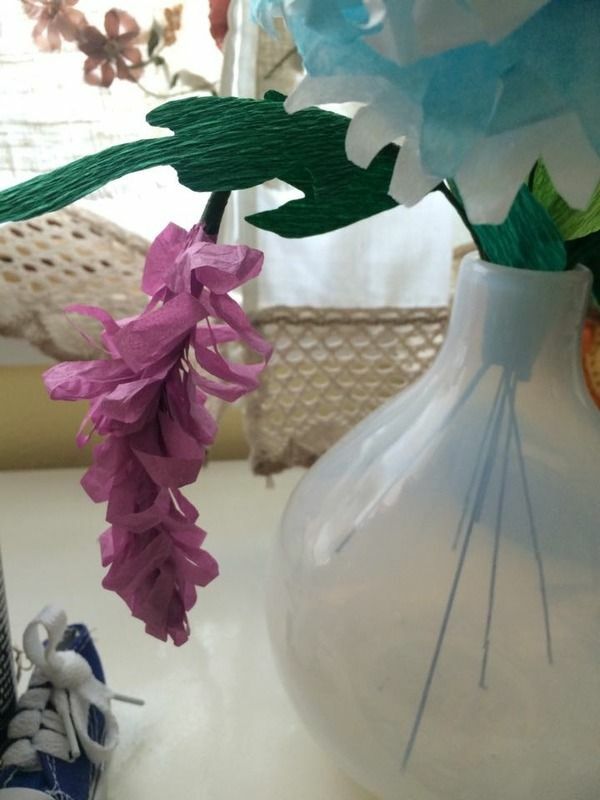 I built the hyacinth on a pipe cleaner, wrapped the sucker to some florist wire with florist tape, turned it upside down and PRESTO ANDANTE, I got my wisteria. Thanks for the tutorial! !